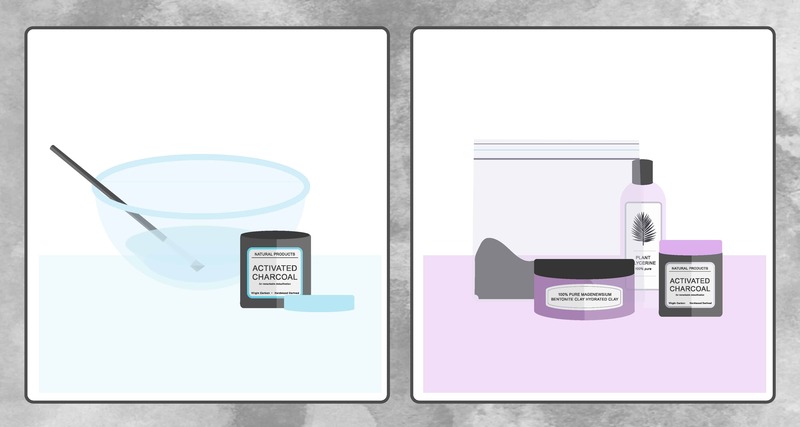 You are here: Home / Beauty / What the Heck Is Activated Charcoal… and Should I Use It? What the Heck Is Activated Charcoal… and Should I Use It? Get ready to meet your next favorite secret beauty ingredient: coal. No, not the kind Santa gives naughty children. We’re talking about activated charcoal, a superfine, highly absorbent black powder. While there are plenty of products made with activated charcoal, you can also buy the pure powder to use in a number of ways. Read on to learn more about activated charcoal’s beauty benefits. Activated charcoal isn’t new: Before it hit the beauty industry it was used in medicine. Because it’s the purest form of carbon, it can pull out toxins, treat poison overdoses, and reduce intestinal gas. It’s odorless, tasteless, and nontoxic so it’s easy to swallow (either in capsule form or mixed with water). Now it’s used topically to extract oils, bacteria, and other toxins and reveal clearer skin. Either in mask form or as a facial cleanser, activated charcoal draws out excess oil and gunk trapped in pores. Use it once or twice a week to avoid drying out your skin. If you suffer from dry skin, the mask may absorb too much of your skin’s natural oils. Activated charcoal uses electrical attraction to stick to molecules and ions, so when you rinse, bacteria and dirt goes with the charcoal. For this reason, activated charcoal is a great treatment for acne. Try steaming your face before applying a mask with activated charcoal; it helps open pores, allowing the ingredient to better draw out dirt and grime. Like facial cleansers, body soaps with activated charcoal exfoliate and remove impurities from your body. Charcoal sponges are another great option: Made of fiber from the konjac plant and infused with activated charcoal, they’re soft enough for daily exfoliation. To use, wet the sponge, then gently massage all over your body. It will provide a deep cleanse without irritating skin. Not washing your hair daily is all the rage and for good reason: Shampooing too much can leave strands dull and dry because it strips essential oils. But going several days without a wash can lead to product and oil buildup that your favorite shampoo may not thoroughly get rid of. Try a shampoo made with activated charcoal: It’ll deep clean your scalp and reduce dandruff. Don’t freak out over the black color—it won’t stain your skin or bathtub. Between washes you can also use activated charcoal in place of dry shampoo to absorb excess oil. Test it first (especially if you have light hair) to make sure the charcoal blends. Many teeth whitening products are costly and contain a number of chemicals. But activated charcoal mixed with mint and orange extract powder whitens, polishes, and reduces tooth sensitivity. You’ll notice whiter results almost immediately since the porous powder attracts and removes the plaque that makes teeth look dull. It’s a good idea to pair the powder with a charcoal toothbrush, otherwise it’ll turn your regular toothbrush black. If washing your teeth with black powder doesn’t sound appetizing, use a charcoal toothbrush with your regular toothpaste. While it may not give you the same whitening effects as the powder, it fights bad breath and prevents bacteria from building up on the brush. Since activated charcoal is great at absorbing poison and toxins, it’s smart to keep some powder handy in case someone in your household gets stung or bit. Create a paste by mixing the powder with water, and apply topically to insect bites or cuts to absorb venom and reduce infection. The paste can help the healing process, relieve symptoms, and even reduce swelling. With its ability to absorb everything from dirt and oil, venom, and other toxins, activated charcoal is a jack-of-all-beauty-and-health trades. Try adding it to your daily or weekly routine. Should You Add a Facial Roller to Your Skincare Routine?